To Cite: Rahimi S, Farshadzadeh Z, Taheri B, Mohammadi M, Haghighi M, et al. The Relationship Between Antibiotic Resistance Phenotypes and Biofilm Formation Capacity in Clinical Isolates of Acinetobacter baumannii, Jundishapur J Microbiol. 2018 ; 11(8):e74315. doi: 10.5812/jjm.74315. Background: Understanding of the biological factors responsible for prevalence and persistence of Acinetobacter baumannii in hospital settings is critical to prevent and control the corresponding nosocomial infections. Objectives: This study was conducted to investigate whether the biofilm-forming ability is associated with the emergence of different antibiotic resistance phenotypes [multidrug resistance (MDR)/extensively drug resistance (XDR) and non-MDR] of A. baumannii. Methods: The capacities of biofilm formation in 80 clinical A. baumannii strains isolated from hospitalized burn patients in Bushehr, Iran, were assessed using the crystal violet staining. Results: The statistical analysis of the relationship between biofilm-forming ability and antibiotic resistance phenotypes among all clinical A. baumannii strains using one-way ANOVA test indicated that biofilm formation capacity of non-MDR A. baumannii isolates was significantly higher than that of MDR and XDR ones (P < 0.001), suggesting an inverse relationship between biofilm formation capacity and the acquisition of MDR/XDR phenotypes. Major international clonal types (ICI and ICII) also exhibited such a significant relationship (P < 0.0001). However, the investigation of A. baumannii IC variants showed no significant relationship between these phenotypes. Conclusions: Given that non-MDR A. baumannii isolates in major IC types were observed to form a strong biofilm compared to MDR/XDR ones, it seems that biofilm may play a key role in the persistence and survival of A. baumannii isolates with an inadequate level of antibiotic resistance. Furthermore, the results showed that the relationship between biofilm and antibiotic resistance phenotypes might be affected by the IC types (major IC types or IC variants). Acinetobacter baumannii is one of the most common causes of nosocomial infections. The high emergence rates of multidrug resistance (MDR) and extensively drug resistance (XDR) among A. baumannii isolates have led them to be considered as one of the top seven pathogens posing threats to medical and health systems (1, 2). In addition to antibiotic resistance, biofilm formation is another characteristic leading to the survival of A. baumannii in the presence of antibiotics and high stresses (1-3). It was revealed that the difference in biofilm formation capacity among international clonal (IC) types of A. baumannii could affect the spreading of this microorganism (4). Conflicting results have been reported by several previous studies on the relationship between biofilm-forming ability and antibiotic resistance phenotypes (MDR/XDR and non-MDR) of A. baumannii. Some studies revealed a direct relationship between biofilm formation capacity and the acquisition of MDR/XDR phenotypes, whereas others indicated an inverse relationship (5-7). Accordingly, there appears to exist not enough studies for precise assessment of the association between the antibiotic resistance and biofilm formation phenotypes, necessitating further investigations. In addition, as mentioned above, biofilm formation capacity could be different among A. baumannii IC types; thus, the relationship between biofilm and antibiotic resistance phenotypes may be affected by IC types (major IC types or IC variants). Accordingly, the comparison of the biofilm-forming ability of major IC types and IC variants in relation to antibiotic resistance phenotypes can be helpful in the precise understanding of the association between biofilm and antibiotic resistance phenotypes. However, such comparison was not performed in previous studies. In this study, the association between these phenotypes was examined in major IC types and IC variants. The present study was conducted to investigate the potential relationship between antibiotic resistance phenotypes and biofilm formation capacity and the impact of IC types on this relationship in clinical A. baumannii isolates. The present research was approved by the ethics committee of Bushehr University of Medical Sciences (code number: B-92-15-18). Totally, 80 clinical A. baumannii strains were isolated from the burn wound of the hospitalized patients in the burn unit of a medical center complex in Bushehr, Iran. The clinical strains were determined and validated as A. baumannii using the API20NE system (bioMerieux, Marcy-l’Etoile, France) and multiplex PCR for the gyrB cluster, respectively (8). Acinetobacter baumannii major IC types and IC variants were determined using three-locus multiplex PCR double assay, as explained previously (9). Moreover, MLVA-8 scheme developed by Pourcel was used to genotype the A. baumannii isolates (10). To determine MLVA-clusters, the allele profiles were distinctively investigated by the molecular evolutionary genetics analysis (MEGA) software version 4.0. (http://www.megasoftware.net). The minimum inhibitory concentration (MIC) of amikacin, ampicillin-sulbactam, cefotaxime, ceftazidime, cefepime, ceftriaxone, ciprofloxacin, gentamicin, piperacillin, ticarcillin, imipenem, meropenem, piperacillin-tazobactam, tobramycin, tetracycline, minocycline, and trimethoprim/sulfamethoxazole was determined using Etest strips (Liofilchem, Italy) and the results were interpreted according to the CLSI guidelines (11). Clinical A. baumannii isolates were categorized into XDR, MDR, and non-MDR according to the international expert proposal for interim standards guidelines (12), as follows: XDR was defined as acquired resistance to ≥ 1 agent in all but ≤ 2 categories, MDR as resistance to ≥ 1 agent in ≥ 3 antimicrobial categories and, non-MDR as resistance to 0 - 2 antimicrobial categories. The biofilm-forming capacity was quantified using the crystal violet staining technique in triplicates and at three independent replicates, as previously defined (6). Briefly, after overnight culture of A. baumannii on nutrient agar, one colony was isolated and suspended in Luria Bertani (LB) broth (Himedia, India). A 200-µL 0.5 McFarland suspension was incubated in each well of a 96-well plate at 35°C. After 48 hours, the culture medium was removed and the wells were washed three times with dH2O. Following incubation with 1% crystal violet dye (200 µL/well) at 25˚C for 20 mintues, the wells were washed twice with dH2O and dried. Finally, 95% ethanol (200 µL/well) was added and optical absorbance was measured at 550 nm (Thermo Scientific GmbH, Driesch, Germany). The reference A. baumannii ATCC 19606 strain and LB medium were considered as positive and negative controls, respectively. In the present study, an OD550 value greater than the negative control was defined as biofilm positive. Strains with OD550 values higher than the negative control and less than the reference strain were used to describe weak biofilm producers, while a D550 value greater than the reference strain was considered as robust biofilm producers. The growth rate of 20 isolates (including 10 strong and 10 weak biofilm formers) was compared with that of A. baumannii ATCC19606 as the reference strain (13). Overnight cultured isolates were diluted 1:100 in LB medium and incubated at 37°C with shaking at 200 rpm for 24 hours. the bacterial growth was assessed every hour by measuring the OD600 values. All tests were performed in triplicate for each strain. The chi-square test was used to compare the categorical variables. Optical densities were exhibited as means ± standard deviations (SDs). To compare optical densities between non-MDR, MDR, and XDR isolates, the One-Way ANOVA test was used. The statistical analysis was performed by using SPSS version 22.0 (SPSS Statistics, Inc., Chicago, IL, USA). In all statistical tests, P < 0.05 was considered significant. All 80 clinical strains were determined and validated as A. baumannii using the API20NE system and multiplex PCR for the gyrB cluster, respectively. Antimicrobial susceptibility proﬁles of all A. baumannii isolates are presented in Figure 1. The highest susceptibility was found to colistin (100%), followed by tigecycline (94%), minocycline (73%), and tetracycline (51%). The resistance rates against the other study antimicrobials, except for cephalosporins (which were higher than 80%), were lower than 60%. Of the 80 A. baumannii isolates examined, 77 isolates exhibited resistance to at least one antibiotic. 33 and 17 isolates (41% and 21%) showed the XDR and MDR phenotypes, respectively. The remaining 34% exhibited the non-MDR phenotype. Overall, the majority of the isolates were IC-variants (43%), followed by ICII (35%) and ICI (23%) (Figure 2). MLVA analysis (at 100% similarity cutoff) revealed that each isolate had a unique MLVA type (MT) and all isolates were grouped into 14 distinct clusters (named A-N) (at 80% allelic similarity). Forty-one percent of all ICI isolates were assigned to cluster A (the largest cluster, n = 27), while 92% (n = 23) of the cluster B (n = 25) members belonged to ICII. Of the 25 cluster B isolates, 21 isolates showed the non-MDR phenotype. The majority of the IC-variants were assigned into cluster N (100%), followed by cluster F (72%) and cluster A (55%). Figure 2. 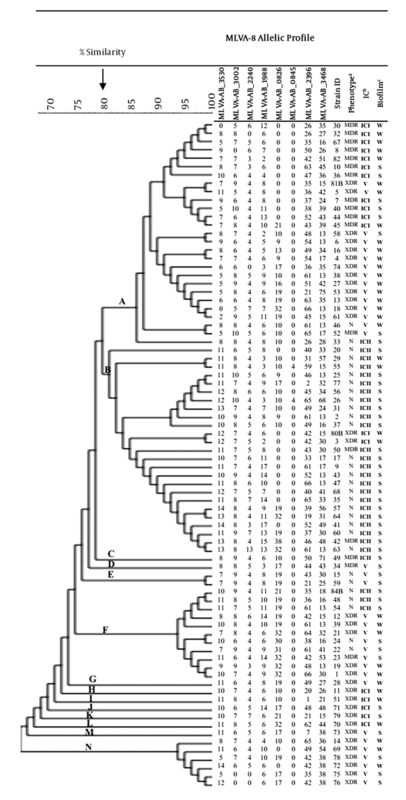 Dendrogram of genetic diversity of A. baumannii isolated from burn patients by MLVA, biofilm formation, international clone, and resistant phenotypes. Abbreviations: MDR, multidrug-resistant; XDR, extensively drug-resistant; N, non-MDR; IC, international clone; Biofilm formation: S, strong; W, weak. The OD550 mean (± SD) for the reference strain A. baumannii ATCC19606 (positive control) and LB medium (negative control) was 0.46 ± 0.04 and 0.060 ± 0.01, respectively. All clinical A. baumannii isolates were found to develop biofilm and 45 (56%) isolates were strong biofilm formers compared to the reference strain. There were no significant differences in bacterial growth between the weak and strong biofilm producers of A. baumannii (Figure 3), indicating that the difference in biofilm development was not related to the bacterial growth rate. Figure 3. Growth rate analysis of strong and weak biofilm former A. baumannii against ATCC 19606. As shown in Figure 4A, 76% of the isolates belonging to IC variants exhibited the XDR phenotype while 39% of the ICI and none of ICII isolates showed this phenotype. Indeed, our analysis revealed that IC-variants (76%) were found to be more frequent among XDR isolates compared to ICI and ICII types (P < 0.0001). The prevalence of non-MDR phenotype was significantly higher among ICII isolates (approximately 90%) compared to IC variants (15%) (P < 0.01). This phenotype was not found among ICI isolates. As shown in Figure 4B, 27 (90%) non-MDR isolates were strong biofilm producers whereas only 35% and 21% of MDR and XDR isolates were able to form strong biofilms, respectively. Indeed, the prevalence of non-MDR phenotype was significantly higher among strong biofilm formers than among weak ones (P = 0.001). Figure 4. Association of resistance phenotype with IC clonal types and biofilm formation index. A, Comparison of frequency of non-MDR, MDR and XDR isolates according to their IC clonal types; B, Comparison of the frequency of weak (W), and strong (S) biofilm forming A. baumannii isolates according to their IC clonal types; C, Comparison of the frequency of weak (W) and strong (S) biofilm formers among non-MDR, MDR, and XDR isolates. The analysis included semi-quantitative measurements of the strength of A. baumannii isolates according to the biofilm formation indices (*P < 0.01). Figure 4C shows that the majority of the isolates in the ICI clone were able to form weak biofilms (61%). The frequency of strong biofilm formers was significantly higher in ICII and IC variant isolates (93% and 65%, respectively) compared to ICI isolates (P < 0.01). Besides, the statistical analysis of the relationship between biofilm-forming ability and antibiotic resistance phenotypes among all clinical A. baumannii strains using one-way ANOVA test indicated that biofilm formation capacity of non-MDR A. baumannii isolates was significantly higher than that of MDR and XDR ones (P < 0.001) (Table 1), suggesting an inverse relationship between biofilm formation capacity and the acquisition of MDR/XDR phenotypes. Investigation of the relationship between biofilm-forming ability and antibiotic resistance phenotypes among A. baumannii major IC types (ICI and ICII) also exhibited such a significant relationship (P < 0.0001) (Table 2). Despite the high prevalence of XDR phenotype (76%) among IC variants, 65% of them were strong biofilm producers (Figure 4A and 4C). The investigation of IC variants showed no significant relationship between the acquisition of MDR/XDR phenotypes and biofilm-forming ability (P = 0.09) (Table 3). It seems that the relationship between antibiotic resistance phenotypes and biofilm formation capacity could be different among IC types. Abbreviations: MDR, multidrug resistant; XDR, extensively drug-resistant. aThe mean optical density at 550 nm, values are presented as mean ± SD. aValues is presented as mean ± SD. In recent years, there has been an increasing number of reports on infections by broad-spectrum resistant-A. baumannii worldwide, especially those involving burn wounds (14-16). Similarly, a high prevalence of such isolates was reported from Iran by our two previous studies (17, 18). Previous studies have demonstrated an increasing trend in the emergence of XDR strains over the last decade in Iran, raising a cause for concern (17-19). Our findings revealed that the majority of the isolates belonging to ICII type showed a non-MDR profile and had a significantly higher capacity to form biofilms compared to IC variants and ICI type. Accordingly, higher biofilm-forming ability appears to be a possible reason for the higher prevalence of ICII compared to IC variants, despite the higher rate of XDR phenotype in the IC variants. Conflicting results have been reported by several previous studies on the relationship between biofilm-forming ability and antibiotic resistance phenotypes (MDR/XDR and Non-MDR) of A. baumannii (5-7). Accordingly, there appears to exist not enough studies for the precise assessment of the association between these phenotypes, necessitating further investigations. As mentioned above, the previous study revealed that biofilm formation capacity could be different among A. baumannii IC types (4); thus, investigation of the relationship between antibiotic resistance and biofilm phenotypes among IC clones can provide precise results. However, such comparison was not performed in previous studies. In this study, the association between these phenotypes was compared in major IC types and IC variants. 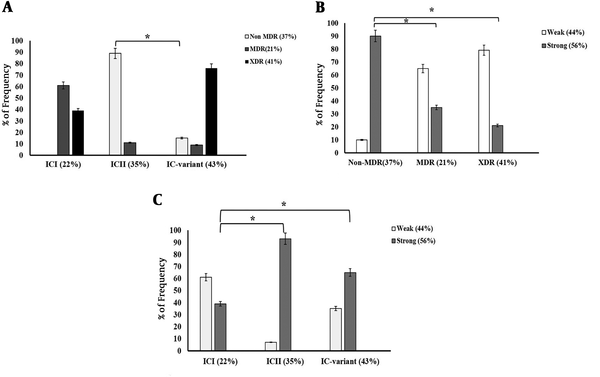 Together, in this study, the evaluation and comparison of biofilm-forming ability between non-MDR and MDR/XDR among all clinical A. baumannii strains revealed that most non-MDR isolates tended to develop stronger biofilms compared to MDR/XDR, suggesting an inverse relationship between multidrug resistance and biofilm formation capacity. Bacterial growth was not different between weak and strong biofilm producers, confirming that the difference in biofilm development was not related to the bacterial growth rate. It seems that susceptible isolates have an inherent tendency to develop stronger biofilms. In agreement with our findings, two previous studies reported a negative relationship between biofilm formation ability and antimicrobial resistance phenotype in A. baumannii (5, 6). Consistent with our findings, their results provided evidence that the ability to develop biofilm may be a crucial determinant in the survival of susceptible or non-MDR bacteria. However, another study indicated a significant association between high biofilm-forming ability and high level of antibiotic resistance (7). Investigation of the relationship between biofilm-forming ability and antibiotic resistance phenotypes among A. baumannii major IC types (ICI and ICII) also exhibited such a significant relationship. However, the assessment of this association among IC variants showed no significant relationship between these phenotypes. It seems that the relationship between antibiotic resistance phenotypes and biofilm formation capacity could be different among IC types. In spite of individual differences among the isolates, investigation of all clinical A. baumannii isolates showed a negative association between the acquisition of MDR/XDR phenotypes and biofilm formation capacity in A. baumannii. These findings warrant a set of research to investigate the potential mechanisms to get an adjustment between biofilm formation capacity and antimicrobial resistance acquisition. Given that such a significant relationship was found among A. baumannii major international clonal types (ICI and ICII) but not among IC variants, the relationship between biofilm and antibiotic resistance phenotypes may be affected by IC types (major IC types or IC variants). This is a report of the database from an M.Sc. thesis. We would like to thank the Tehran University of Medical Sciences, Tehran, Iran, for funding this study. Authors’ Contribution: Abbas Bahador and Mohammad Ali Haghighi conceived the study. Abbas Bahador, Sara Rahimi, Zahra Farshadzadeh, Mohammad Ali Haghighi, and Behrouz Taheri, developed the protocol, abstracted, and analyzed the data. Sara Rahimi drafted the manuscript. All the authors reviewed the manuscript. Sara Rahimi and Zahra Farshadzadeh contributed equally to the study. Funding/Support: This research was funded by Bushehr University of Medical Sciences with health Services grant No. 71/8439. 1. Singhai M, Malik A, Shahid M, Malik MA, Goyal R. A study on device-related infections with special reference to biofilm production and antibiotic resistance. J Glob Infect Dis. 2012;4(4):193-8. doi: 10.4103/0974-777X.103896. [PubMed: 23326076]. [PubMed Central: PMC3543538]. 2. Farshadzadeh Z, Taheri B, Rahimi S, Shoja S, Pourhajibagher M, Haghighi MA, et al. Growth rate and biofilm formation ability of clinical and laboratory-evolved colistin-resistant strains of Acinetobacter baumannii. Front Microbiol. 2018;9:153. doi: 10.3389/fmicb.2018.00153. [PubMed: 29483899]. [PubMed Central: PMC5816052]. 3. He X, Lu F, Yuan F, Jiang D, Zhao P, Zhu J, et al. Biofilm formation caused by clinical Acinetobacter baumannii isolates is associated with overexpression of the adeFGH efflux pump. Antimicrob Agent Chemother. 2015;59(8):4817-25. doi: 10.1128/AAC.00877-15. [PubMed: 26033730]. [PubMed Central: PMC4505227]. 4. Hu Y, He L, Tao X, Meng F, Zhang J. Biofilm may not be Necessary for the Epidemic Spread of Acinetobacter baumannii. Sci Rep. 2016;6:32066. doi: 10.1038/srep32066. [PubMed: 27558010]. [PubMed Central: PMC4997352]. 5. Perez LR. Acinetobacter baumannii displays inverse relationship between meropenem resistance and biofilm production. J Chemother. 2015;27(1):13-6. doi: 10.1179/1973947813Y.0000000159. [PubMed: 24621167]. 6. Qi L, Li H, Zhang C, Liang B, Li J, Wang L, et al. Relationship between Antibiotic Resistance, Biofilm Formation, and Biofilm-Specific Resistance in Acinetobacter baumannii. Front Microbiol. 2016;7:483. doi: 10.3389/fmicb.2016.00483. [PubMed: 27148178]. [PubMed Central: PMC4828443]. 7. Gurung J, Khyriem AB, Banik A, Lyngdoh WV, Choudhury B, Bhattacharyya P. Association of biofilm production with multidrug resistance among clinical isolates of Acinetobacter baumannii and Pseudomonas aeruginosa from intensive care unit. Indian J Crit Care Med. 2013;17(4):214-8. doi: 10.4103/0972-5229.118416. [PubMed: 24133328]. [PubMed Central: PMC3796899]. 8. Higgins PG, Lehmann M, Wisplinghoff H, Seifert H. gyrB multiplex PCR to differentiate between Acinetobacter calcoaceticus and Acinetobacter genomic species 3. J Clin Microbiol. 2010;48(12):4592-4. doi: 10.1128/JCM.01765-10. [PubMed: 20881170]. [PubMed Central: PMC3008493]. 9. Turton JF, Gabriel SN, Valderrey C, Kaufmann ME, Pitt TL. Use of sequence-based typing and multiplex PCR to identify clonal lineages of outbreak strains of Acinetobacter baumannii. Clin Microbiol Infect. 2007;13(8):807-15. doi: 10.1111/j.1469-0691.2007.01759.x. [PubMed: 17610600]. 10. Pourcel C, Minandri F, Hauck Y, D'Arezzo S, Imperi F, Vergnaud G, et al. Identification of variable-number tandem-repeat (VNTR) sequences in Acinetobacter baumannii and interlaboratory validation of an optimized multiple-locus VNTR analysis typing scheme. J Clinical Microbiol. 2010;49(2):539-48. doi: 10.1128/jcm.02003-10. 11. Clinical and Laboratory Standards Institute [CLSI]. Performance standards for antimicrobial susceptibility testing; twenty fourth informational supplement M100-S25. Wayne, PA: CLSI; 2015. 12. Magiorakos AP, Srinivasan A, Carey RB, Carmeli Y, Falagas ME, Giske CG, et al. Multidrug-resistant, extensively drug-resistant and pandrug-resistant bacteria: an international expert proposal for interim standard definitions for acquired resistance. Clin Microbiol Infect. 2012;18(3):268-81. doi: 10.1111/j.1469-0691.2011.03570.x. [PubMed: 21793988]. 13. Hung KH, Wang MC, Huang AH, Yan JJ, Wu JJ. Heteroresistance to cephalosporins and penicillins in Acinetobacter baumannii. J Clin Microbiol. 2012;50(3):721-6. doi: 10.1128/JCM.05085-11. [PubMed: 22189112]. [PubMed Central: PMC3295183]. 14. Farshadzadeh Z, Hashemi FB, Rahimi S, Pourakbari B, Esmaeili D, Haghighi MA, et al. Wide distribution of carbapenem resistant Acinetobacter baumannii in burns patients in Iran. Front Microbiol. 2015;6:1146. doi: 10.3389/fmicb.2015.01146. [PubMed: 26539176]. [PubMed Central: PMC4611150]. 15. Yu Y, Chen M, Jinli L, Su J. Clinical and molecular epidemiological characterization of extensively drug-resistant Acinetobacter baumannii in patients with liver disease. Int J Clin Exp Med. 2016;9(7):13127-34. 16. Azimi L, Talebi M, Pourshafie MR, Owlia P, Rastegar Lari A. Characterization of carbapenemases in extensively drug resistance Acinetobacter baumannii in a burn care center in Iran. Int J Mol Cell Med. 2015;4(1):46-53. [PubMed: 25815282]. [PubMed Central: PMC4359705]. 17. Bahador A, Raoo An R, Farshadzadeh Z, Beitollahi L, Khaledi A, Rahimi S, et al. The prevalence of IS Aba 1 and IS Aba 4 in Acinetobacter baumannii species of different international clone lineages among patients with burning in Tehran, Iran. Jundishapur J Microbiol. 2015;8(7). e17167. doi: 10.5812/jjm.17167v2. [PubMed: 26396712]. [PubMed Central: PMC4575776]. 18. Bahador A, Raoofian R, Taheri M, Pourakbari B, Hashemizadeh Z, Hashemi FB. Multidrug resistance among Acinetobacter baumannii isolates from Iran: changes in antimicrobial susceptibility patterns and genotypic profile. Microb Drug Resist. 2014;20(6):632-40. doi: 10.1089/mdr.2013.0146. [PubMed: 25029126]. 19. Bahador A, Taheri M, Pourakbari B, Hashemizadeh Z, Rostami H, Mansoori N, et al. Emergence of rifampicin, tigecycline, and colistin-resistant Acinetobacter baumannii in Iran; spreading of MDR strains of novel International Clone variants. Microb Drug Resist. 2013;19(5):397-406. doi: 10.1089/mdr.2012.0233. [PubMed: 23768166].